A big bear swaggers and walks with attitude. He doesn’t jump at every sound like a small bear will. A big bear doesn’t have to; he believes he’s got nothing to fear. Once you’ve spotted your bear on the bait site, it’s time to get serious about analyzing how that bear is behaving. A big, old sow will have all, or more correctly, almost all of the physical characteristics of a big, old boar. She’ll have the nasty looking face that’s seen one too many years in the ring, the potbelly and the sway back. Watch to see if the bear stands on his hind legs and rubs his back on a tree, that’s a boar. If it walks along and straddles small trees, wiping its scent on that tree, it’s a boar. If it stands up and breaks saplings over its shoulder, it’s a boar. If it encounters another bear and gives chase, it’s a boar and if it is following a smaller bear, it’s a boar. SCALE: There is one last general appearance tip to judging black bear that makes the top three in importance, and that is scale. A big bear looks big . . . but so does a closer, smaller bear. Here’s a help tip on how to gauge more accurately. If the bear is 150 yards away but the hunter thinks the bear is 200 yards away, the hunter will overestimate the bear’s relative size by somewhere near 25 percent. In other words, the hunter is in for a serious case of ground shrink when he walks up to his bear. TIP: Let the bear get as close to you as possible and preferably on the bait itself. The closer the bear, the less chance there is of misjudging the distance to relative size. 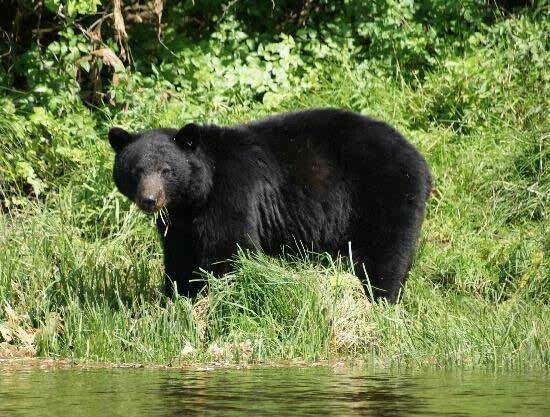 SPECIFIC TIPS FOR JUDGING BLACK BEARS: If the bear fails any one of the above general conditions, then it’s advisable to pass up on it or let the bear walk. It’s tough and you could be wrong, but at least there isn’t a dead small bear lying on the ground. Call it a personal aversion to guilt. BODY SHAPE: Bigger bear are older bears, and like most of us, they don’t have the svelte bodies they once did. They tend to look “heavy” and out of shape. Remember, they monopolize the best feed and habitat, and therefore exert less energy to live. HEAD SHAPE: A big bear (boar) will have a deeper, wider and longer snout than a smaller bear or a female. His ears will appear to be wide apart and small. If he is aware of you and looking your way, his ears won’t stand up on top of his head like a dog’s ears, they’ll seem to be aimed out to the side of his head. A big bear will have well developed “bulging” muscles on the top of his head. LEGS: A big bear will have massively developed front shoulders. His shoulders will look big and burly. A sow’s wrist will pinch in directly above the foot. Not so with a boar. The lower forearm, wrist and the foot on a big boar are all the same width. A big bear often appears to have shorter legs because the body is so much thicker, but keep in mind that the best-scoring bears for the records book are often the lankier looking, longer-bodied bears. There are bear that have meatier heads; bear that look great and are great trophies, but that don’t score well. There are others that have short skulls, block- headed beasts that look impressive, but that don’t score well at all and there are lanky, skinny bears with donkey faces that score like the devil, but that a hunter seriously looking for a records book bear wouldn’t walk across the street for. Black bear morphology is just too darn diversified to make a science out of judging. The best way to hunt for a record boar is to simply shoot the bear that looks good to you and that hopefully you’ll appreciate all the time and effort you put in for the hunt. If it’s got a nice hide, be happy with your animal. If it has long claws and weighs a ton, good for you and congratulations. If it isn’t as big as you’d like, don’t fret, you’re not alone and the rug on your wall will still look great. If it happens to be one of those rare few bears that has grown a skull that qualifies for the record books, thank your guide for the good fortune that made that bear come to the bait site. Mickey Mouse ears means a small bear. Legs that appear short means big bear. 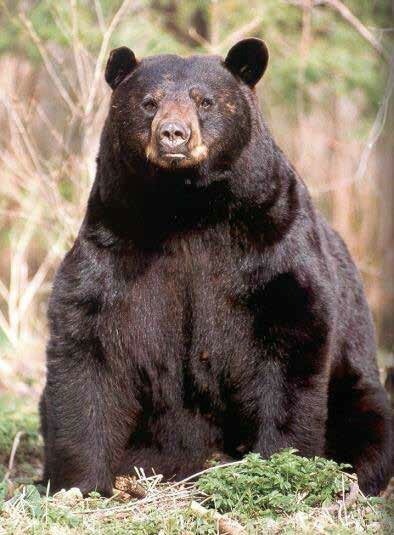 Watch the bear’s behavior around the bait – small bears will be skittish and afraid of a larger bruin in the area. Look for a log around the bait and use it as a reference, check to see the length and height of the log before climbing into your stand. When the bear enters the bait site use the size of the log to help determine the overall size of the bear. Hope this information helps develop your judging skill on your next hunt, and, good luck out in the field.